The album inside the box has some clever elements but is pretty simplistic in style as I wanted it to be functional but I really went to town making a beautiful box and display stand for it. The display stand is pretty sturdy as it is made out of a double layer of chipboard. 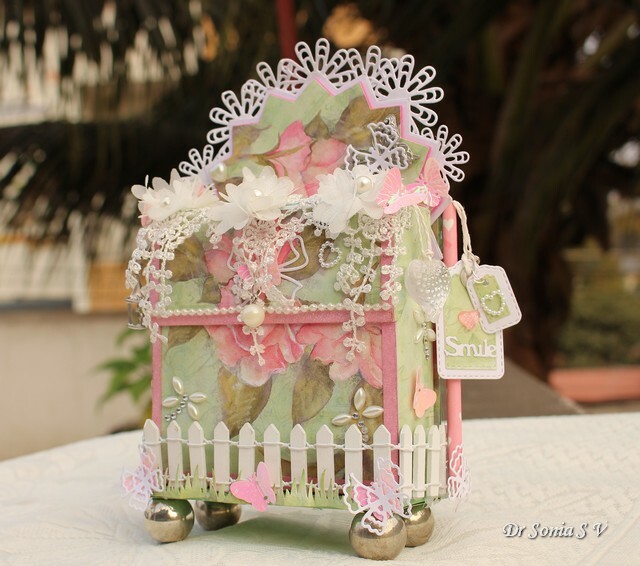 On the base I added a wooden fencing with grass and fluttering butterflies. 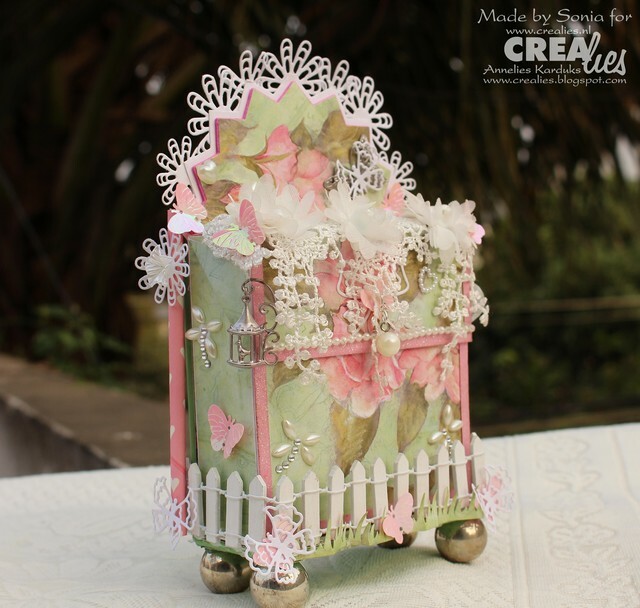 The 12 pointed star on the upper part of the stand is made with the new Crealies dies and I added lacy Crealies flowers behind for a shabby chic look. The stand has pink paper straws on the sides and I dangled tags with hearts and pearls on the straw on one side. It adds such a fun element to the project! The display stand has a chipboard and foam base with large silver beads as feet to raise it above the ground! The Mini album box snugly fits inside the stand and I used the same pattern paper to create both so that they match perfectly! Here is the box when you take it out of the display stand. Apart from the floral lace trim it is pretty simple. Dangling from one side of the lid is a silver bird cage . 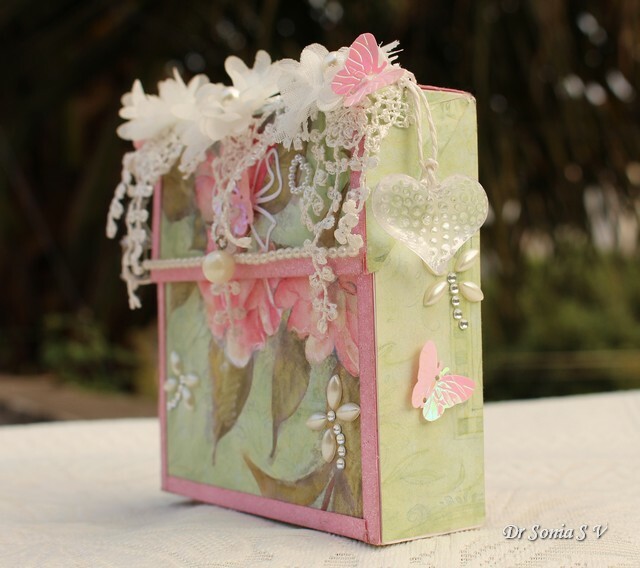 And here is the back of the box....simple and beautiful with just the gorgeous floral design from the pretty paper! 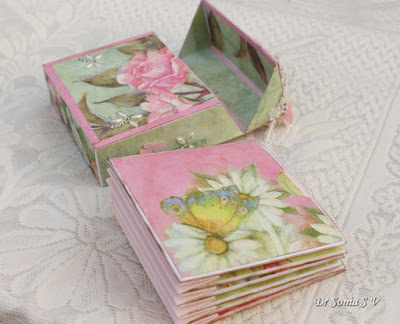 The box is has a flip top lid and is lined with pattern paper on the inside too. 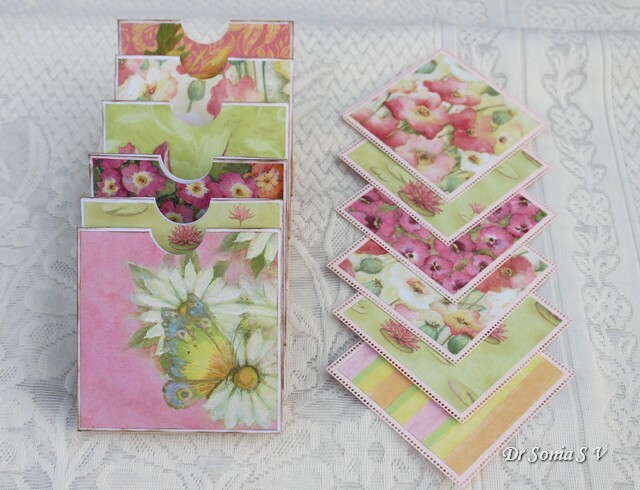 The box houses a 4 ¾ x 4 ¾ inch square mini album made with the new Crealies square dies. The mini album is rather special as it is a cascading album made up of 6 pockets each of which can house photo mats measuring 4¼ inches. The pockets of the mini are held together on an accordion which expands and cascades out ! 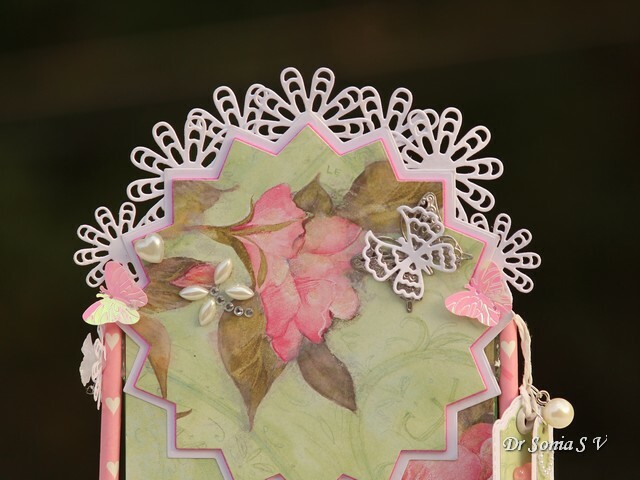 The inspiration behind the cascading style is Amanda's album which she made using a kit. The pockets and the photo mats were made using square Crealies dies. I hope you liked the ideas ! Wow!! This is stunning, Sonia!! Love it!! 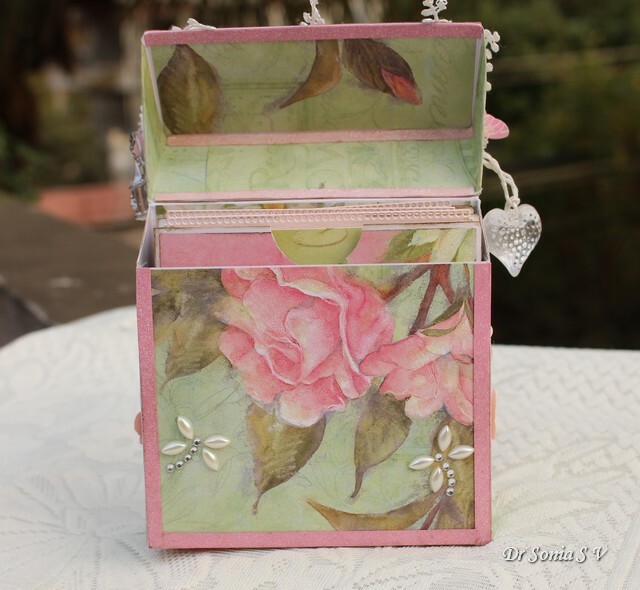 Another amazing project from you Sonia, it is absolutely stunning and yet when you describe it step by step you make it all sound so easy to achieve. 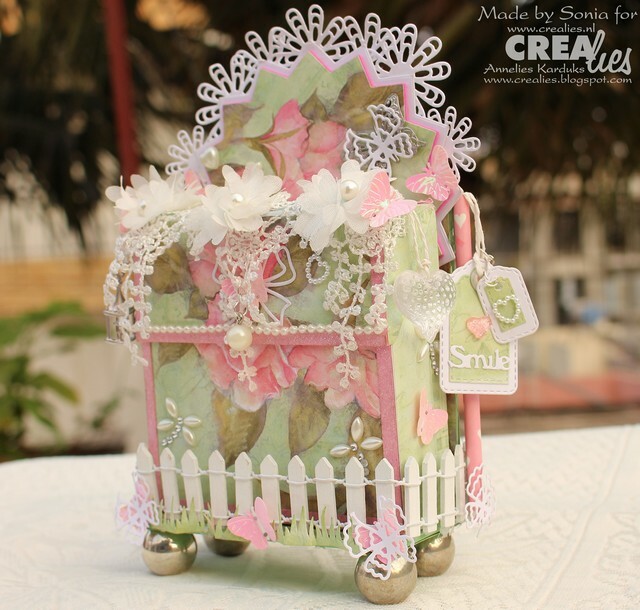 Over the top Shabby chic Gorgeous !!! 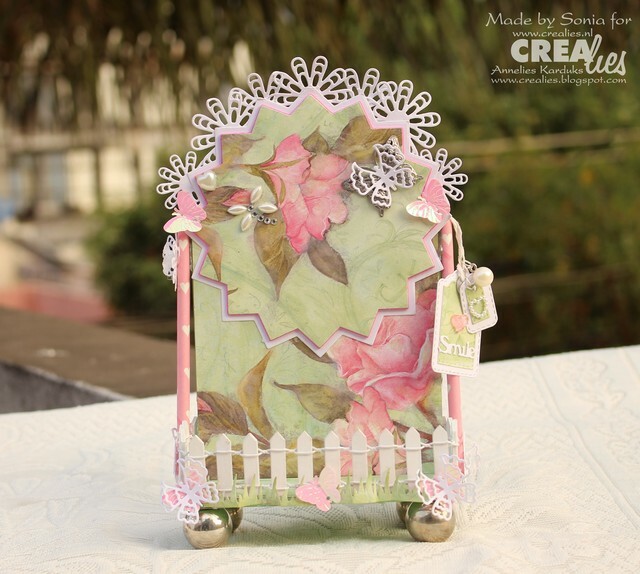 And not just beautiful looking but clever use of mechanisms too :) Crealise team is licky to have a DT member like you..showcasing the dies in various fabulous ways !! Watched the video and the cascading album is just Wow !! 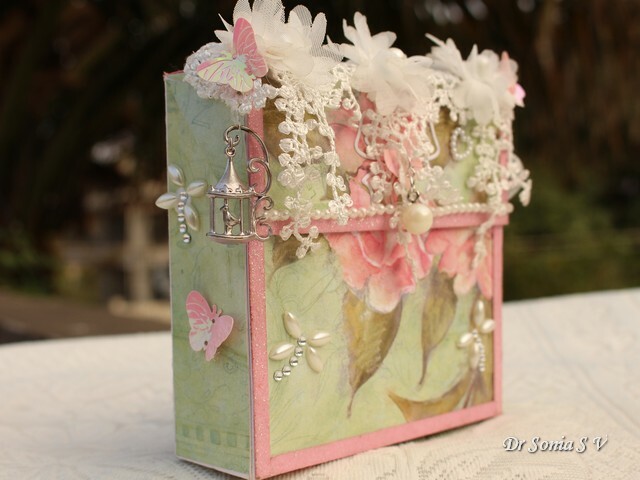 Oh wow what an amazing project and tutorial Sonia. 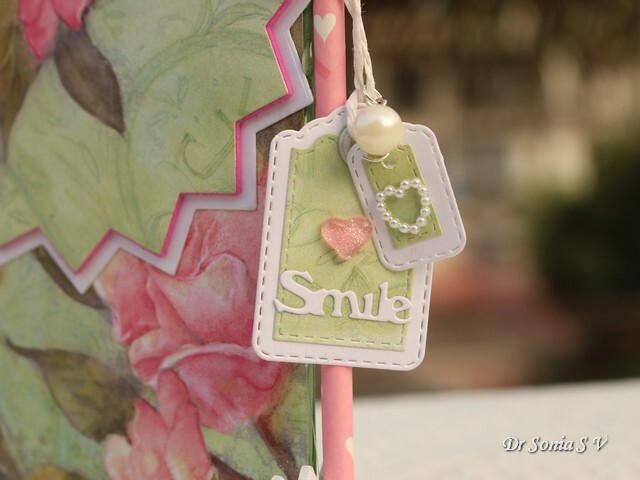 I love the beautiful papers that you've used and the gorgeous shabby chic feel that it's got too. This is STUNNING! 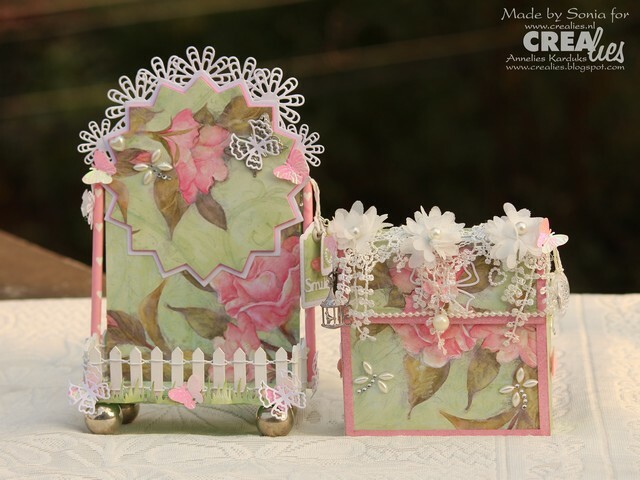 LOVING the flowers, the colors and the picket fence!!!! 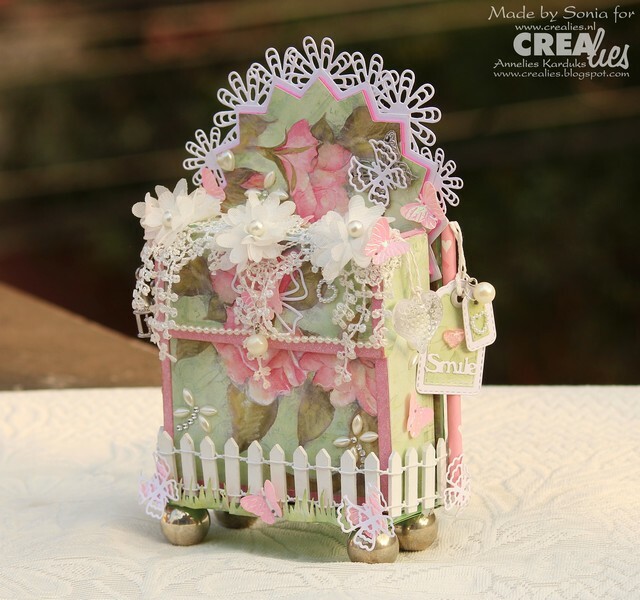 This is beautiful Sonia, lots of beautiful details and fabulous design - so pretty. Wow! How do you come up with these ideas! Not only gorgeous to look at, but functional too! Gorgeous work. 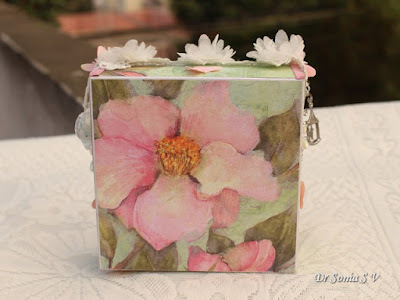 You really create some of the cutest projects, Dr. Sonia! 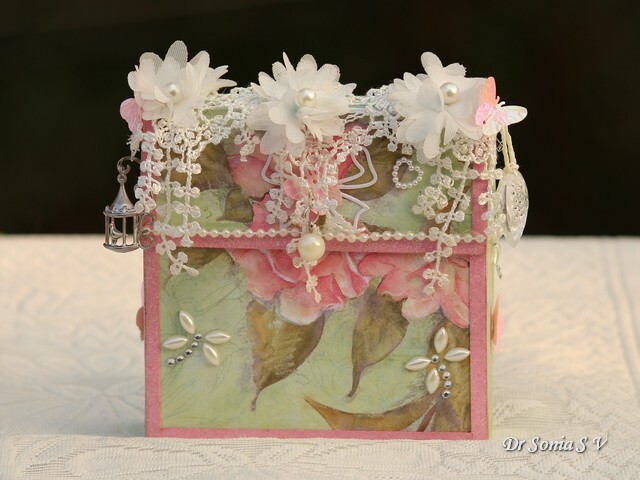 And this cascading album is so adorable and unique! Makes for a wonderful keepsake! 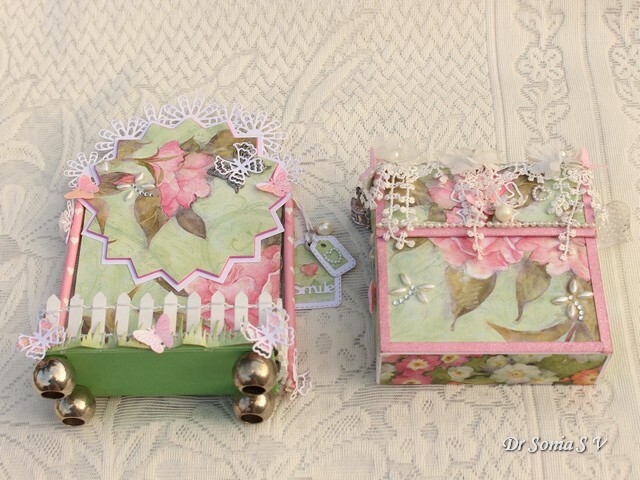 What a joy to visit and see such original and creative beauty in a fabulous box with so many wonderful details. Amazing work Sonia. Wow!! This is amazing! I love all the little details on the box and stand! Very beautiful. The silver bird cage looks very cute. Absolutely gorgeous! I love it and you did a great job! This is so lovely and elegant! Thank you so much for the tutorial , I have a whole File of your tutorials, hoping that someday I will have the time to make them . wow! That's really amazing! You have created a stunning mini album. Thank you for the tutorial. OMG!!!!!!! This is amazing, Donia!!!!!! I always love watching your video tutorials. Many many kisses and hugs, my dear friend. WOW WOW!!! How many work on this album and such STUNNING result!! Any detail is gorgeous!! Fabulous job!